The villages of Langford and Little Faringdon lie two miles apart, in the far south-west of Oxfordshire. Until the middle of the nineteenth century they were in the ancient county of Berkshire, part of Faringdon Union. Little Faringdon was an estate village, owned by a single landlord, the epitome of a 'close' village. 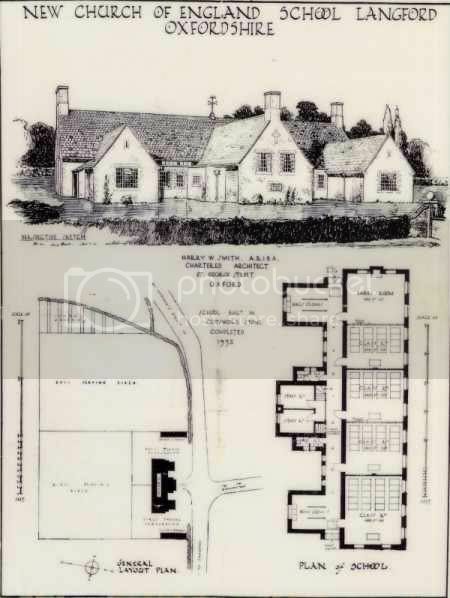 The chief landowner at Langford was the Ecclesiastical Commission, and its standing as on 'open' village was confirmed by the presence of three non- conformist chapels, several pubs, and a more varied pattern of houses and cottages. The combined population of the villages, according to the Post Office Directory of 1841, totalled 630: by the time of the 1891 census it had sunk to 490, a decline of more than 20%, as the farming recession bit deeper and people moved away in search of employment. The village schools of Langford and Little Faringdon are particularly rich in records. Their Log Books and School Admission Registers are complete from the date of their adoption by the Department of Education following Forster's Education Act of 1870; for records earlier than this the census returns from 1851 enumerate the 'scholars' among the children of the parishes, while Directories for Oxfordshire, Berkshire and Buckinghamshire list the schools and the teachers for the years that they were published. Little Faringdon's school and school house were 'built by W Vizard Esq., supported entirely by his lady, Mrs Vizard' in 1847; the date is confirmed by its incision over the door of the school. It was to accommodate 40 children, though the average attendance in 1895 was 20.. After their purchase of the estate in 1864 Lord and Lady de Mauley in their turn 'entirely supported 'the school. 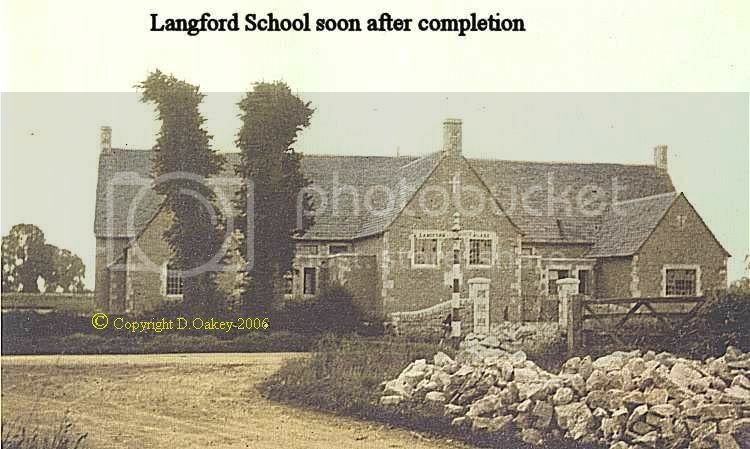 This seems to have been the first school in Little Faringdon, but at the beginning of the nineteenth century Langford was particularly rich in schools. In 1808 there were six, including a boarding school and a day school for girls. The number varied during the following years; Gardner's Directory for Oxfordshire of 1852 included a 'National School recently established'. 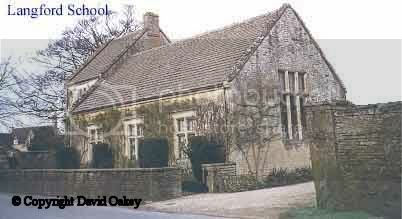 The first mention of a school which was aided by a Parliamentary Grant was in 1867; the Post Office Directory for Oxon. of 1869 includes a 'Parochial school for boys and girls, supported by subscription'. The school room in Langford was evidently viewed as a communal resource, and was often in demand for village activities. The Log Book regularly mentions its use for the annual Vegetable Show in September, for the Clothing Club in November, while in 1896 there was a 'Poll'; on occasions such as these the school had to be closed. Little Faringdon School, on the other hand, was the property of the de Mauleys, and was not used by the villagers; while it was being repaired in 1902, teaching took place in the de Mauleys' laundry. At Langford, the School Treat was held in the school; in Little Faringdon the children were given tea at the 'big house'. From 1851 until 1891 the Census returns show how many children went to school, although the 1891 entries are very inaccurate and the figures in this case come from the School Admissions Register. The proportion of children who attended school rose steadily, from 25% in 1851 to 80% in 1891. At first the proportion of scholars to population of Little Faringdon, under the watchful eye of its owner, was considerably higher than at Langford, but by 1891 they had become the same. At the same time the parish marriage registers show that illiterates were diminishing steadily; after 1891 only one man, an elderly widower from the outlying village of Grafton, made a cross instead of signing his name. In November 1875 Langford School, and in April 1879 Little Faringdon School came under Government Inspection. From these dates a detailed weekly record was kept in the Log Books following the New Code of Regulations for 1872. At first the entries in both schools' Log Books were perfunctory, noting the attendance in vague terms as 'small' or 'better than last week' or even 'much better.' At Langford the first Report from the Inspector was not copied into the Log Book, and the Register went unchecked; the entries reveal the easy-going methods of the teachers. With the appointment of Miss Newcomb at Langford in August 1879 the deficiencies became apparent. The previous teacher had 'left the greater part of her Register to add up.' Her successor refused to do this retrospectively, 'for when I leave the Schoolroom in the afternoon I am completely used up'. Both schools were under the jurisdiction of the Church of England, and the Log Books detail the annual report from the Diocesan Inspector's visit. The children of Little Faringdon were taken to church much more often than those at Langford, where non-conformity was stronger: during 'Holy Week 'before Easter they went to Church each morning. In 1887 SO many days had been taken as holidays that a new teacher shortened the Whitsun holiday to two days, so that the necessary attendances could be achieved. Reasons for absence were carefully noted in the Log Books. in both villages children went absent to go to local festivities: May Day in 1884, the annual Temperance Fete in Langford in July, Langford Feast every September. From Little Faringdon the pupils went to Lechlade Carnival; on two occasions they 'took the Monitress with them', though we are not told whether she had permission from the teacher to be absent from her duties. Attendance was affected in both villages by wet or 'winterly' weather; there were families who lived at outlying farms who might be away from October until Spring; at Langford this could mean 17 fewer pupils. Another reason for absence was 'several children not being able to put on their boots, having bad feet from the severe weather'. The roads were sometimes covered with water or with snow; in January 1910 three boys reached school, half an hour late because they had been sliding on an icy pool and had detained (forcibly) an infant who also was marked late.' Sometimes so few children arrived that it was considered advisable to dismiss those present. The pupils changed as children moved with their parents to other villages. In both schools this movement was worst in October, the time of the 'mop fair' in Faringdon, when 'the labourers are hired from Michaelmas to Michaelmas'. In September 1900 the teacher at Little Faringdon complained that 'The annual changing of the children makes it very difficult to teach them properly, so as to have good results from their work'. It was especially hard that the moving took place just before the annual examination, so 'occupying time and space needed for those about to be examined,' while the teachers found that 'as a rule the newcomers are very backward'. Sometimes fewer children moved to the village than left it. In October 1902 Little Faringdon school had '4 children only in place of the 10 who have left. 2 cannot read or write, the other two can read & write fairly well but can do nothing else'. It was commonplace that the start of the school year, after the harvest, was slow. At Langford during the first four weeks of September 1888 there were 17 or 18 pupils present out of a possible 67. Altogether this was a difficult time, when ground lost during the long Harvest break had to be made up; in 1897 a new teacher found that 'the children have forgotten a great deal of the work they had learnt before holidays'. When gleaning was over children of both sexes were kept at home 'to mind babies and to gather acorns'; beans were gleaned, potatoes picked; in the spring children had 'to gather cowslips'. Occasionally a pupil was needed to 'nurse her sick mother and order the house in default of any other helper,' while 'taking dinner to father in the field' was a common reason for absence in Little Faringdon. From 1890 onwards the Attendance Officer began to warn the irregular attenders, making a list of their names from the Registers; parents were cautioned 'owing to the very poor attendance of some of the scholars'. This was not always effective: at Little Faringdon the teacher complained in March 1906, 'I have taken E Jefferies name off roll, as she has only attended one week out of eleven, although mother has promised to send every week,' but there were no prosecutions for persistent absence from either school. Gradually the children's health became a matter of national interest. The first note of a medical certificate for non-attendance was in 1889; in April 1899 two pupils at Little Faringdon sent a 'Doctor's Certificate for absence' for ringworm. They did not return until November, when 'they have forgotten nearly all they had learnt, even their letters. 'In l901 the children of Langford were visited by the Medical Officer of Health; regular visits to both schools began in 1908. The children were weighed and measured and their heads were inspected regularly for vermin. The Log Books record visits from the Vicar, who acted as the Correspondent to the Managers; at Langford these visits were at first sporadic, but after 1879 they became much more frequent, often daily. His comments were noted and valued. He provided the new slates, books and desks needed in the school. He was responsible for receiving and paying out the salaries of the teacher; he distributed prizes, and acted as general adviser. He also regularly checked that the numbers in the Registers corresponded with the numbers of children in the school, and made an entry in the Log Book to validate this. On other occasions she dictated a few sums to the children, heard the upper standards say their tables, and took a class in reading. She was especially interested in their needlework, and provided material for them to use, and in knitting: 'Her Ladyship remarked on seeing some small children knitting that it is a good plan for them to begin young.' Generally she expressed herself pleased with what she saw, although occasionally she offered some gentle criticism. In January 1880 'she heard the children sing. She commanded soft singing and told the children to sing a very little bit softer.' She also paid £30 of the teacher's salary, to supplement the Government grant of £20, in addition to the pence received from any children over the number of 20 attending the school. In both schools the subjects taught were those which were awarded grants by the Education Department on the results of examination. At first these were the 'Elementary Subjects' of reading, writing and arithmetic. In Langford, passes in the 'Class Subjects 'of grammar, geography, singing and history also attracted grants, with needlework as an additional subject for girls. In 1883 'the Infant Boys commenced to do Needlework'. The children were also taught Object Lessons from objects or pictures which were readily available to the teacher: in 1883 these included 'Cheese making, Snails, Soap, Rice, Harvest work, the Fish'. The Education Department also kept an eye on the suitability of the buildings. In 1878 they noted with approval that 'a boarded floor is to be laid down' in Langford; while in Little Faringdon in 1898 they complained that 'the water used in the school and teacher's house has to be brought a distance of about 300 yards. Could not the Managers provide a supply on the school premises?' The playground at Langford was made 'fit for Physical Exercises' in 1901, with the increased emphasis on national fitness which followed the Boer War. Progress in both schools reflected the ability of their teachers. Joshua Walker was appointed Headmaster of Langford School in 1881, when the school was 'in an unsatisfactory state', and remained in office until 1909. On his appointment he found 'all standards backward, they don't seem to have done a weeks (sic) thorough work since the last examination'. Within a year of his arrival he had drawn up a list of rules on 'Punctuality, Cleanliness & Neatness and Truthfulness'; three days later he denied admittance to a pupil for refusing to comply with 'the rule of the school'. Good work was rewarded with illuminated certificates which he provided, rewards were given for perfect attendance. Physical punishment was rare; shocked by the bruises caused by Miss Newcomb's use of the cane, the Vicar had prohibited corporal punishment of any kind, and exclusion from school was generally effective enough. During his twenty-eight-year headship Joshua Walker introduced lessons in drawing and nature study, as well as practical gardening; by 1902 Langford School had won the Gardening Prize offered by St John's College, Oxford, several years running. Mr Walker was commanded by the Education Department's Inspector as conducting the school with vigour and intelligence. The standards reached improved steadily; by 1893 the first Standard VI was achieved. The grant which resulted from examination passes and annual attendance rose from £34.11.0 in 1880 to £68.0.0 in 1901, augmented by annual Merit Grants for 'excellent' teaching. The Headmaster's wife taught needlework at Langford for thirty two years. Her teaching was interrupted by absences of three to four weeks, when the Log Book noted that she was 'not well'; the dates coincide with those of the christenings of Walker children given in the Parish Register of Baptisms. Mr and Mrs Walker were assisted by a series of teachers for the Infant Class. These were not always satisfactory: in 1885 Mr Walker noted that one had 'been at work now a Fortnight but at present I find her of no use whatever'. Other assistant teachers were more successful: Emily Lafford attended the school from 1875 until 1878, gaining Standard III; she became a Pupil- Teacher at the age of eleven in 1879, and went on to gain a Queen's Scholarship to train for a professional qualification after twenty years' teaching. There were also Monitors in both schools; their duties were to assist with the Infants and, in the case of William Tanner at Langford, to light the fire before school, which he sometimes failed to do. 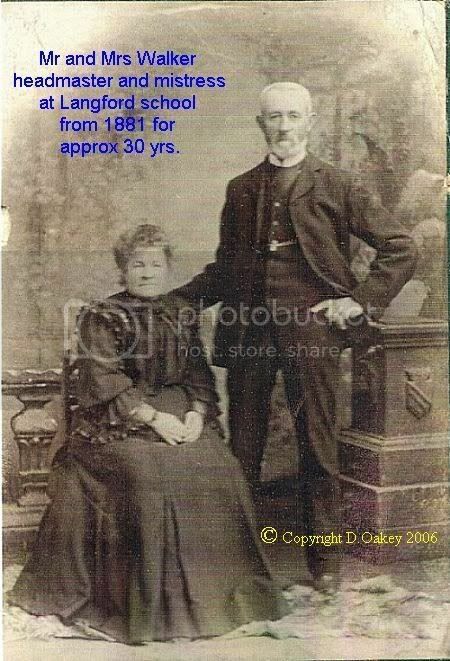 His salary in 1907 was £l0 a term. In Little Faringdon in 1903, Patience Green, aged nearly 14, was paid one shilling a week as a Monitress. The progress achieved by Joshua Walker at Langford was not matched in Little Faringdon, despite Lady de Mauley's enthusiasm. Teachers stayed only a few years, discouraged by the rapid turnover of pupils. In March 1903 one reported that 'so many of the children are newcomers that the general average of attainment is not very high'. Prizes were given to children both for 'Conduct' and for 'General Progress' but in the twenty-six years from 1879 to 1905, only three children attained Standard IV, roughly that of a ten-year-old, and none was recorded as reaching the higher Standards. There were persistent hopes of each new mistress, but in December 1903 the Log Book notes that 'the children are making a little progress in their work & seem anxious to do their best, but it is still very inaccurate'. Both the teachers and the Vicar misunderstood the growing and complex demands of the Education Department. No 'Class Subject' was taught in 1895, and as a result the whole annual Grant was withdrawn, despite the Vicar's protests. Subsequent years did not improve matters. Expectations continued to be low, attendance short-lived and numbers too small to divide the pupils into groups for separate teaching. Successive Government Inspections found the standard of the school unsatisfactory. It finally closed in 1920, when the few remaining pupils transferred to Langford School. Miriam James came to the village of Langford from London in 1940. She was educated at Mayfield School, Sussex, and at St Anne's College, Oxford. She subsequently became Head of history at Carterton Community College. Now retired, she has recently completed a Master of Studies degree in English Local History at Kellogg College, Oxford. As part of this degree she studied the early development of the schools in the neighbouring villages of Langford and Little Faringdon, with an emphasis on the influence of their contrasting status as an 'open' and a 'close' village and of the people involved in the teaching and patronage of the two schools.